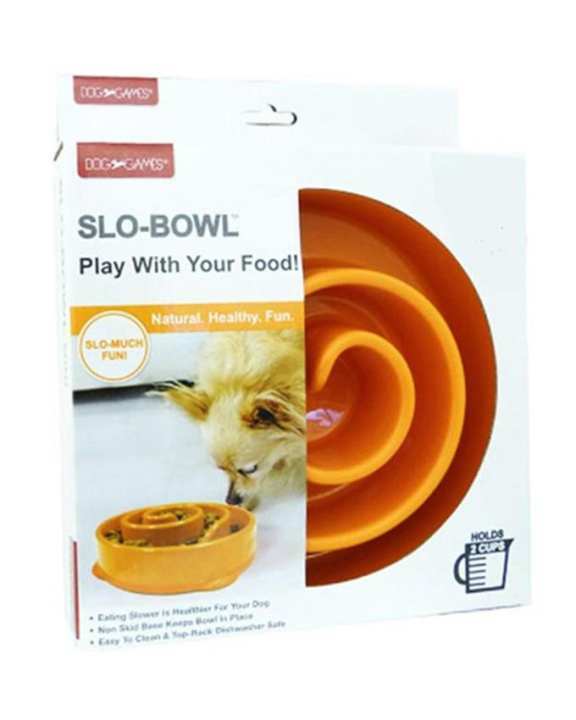 Dog Games Slo-Bowl Slow Feeder Coral sports a unique spiral design to slow down dogs that devour their meals too quickly, thereby promoting healthy eating habits. Dogs that eat too quickly risk the chance of bloating, choking, regurgitation, and obesity. The bowl reduces these risks by separating food with a small barrier, forcing dogs to move and reach for their food rather than consume it all at once. The simple design of this slow feeder is easy to use and holds up to two cups of dry dog food. The bowl is made with high-quality materials deemed food safe and has a rubber foundation to prevent the bowl from sliding and spilling.